No matter the era, the weather remains nature’s way of reminding us who is Boss. In a response to W.M. Nixon’s Sailing on Saturday blog post for Afloat Magazine last week, Peggy Bawn Press publisher and author, Hal Sisk, contributed a fascinating, myth-busting comment on the earliest days of sailing… as a sport… or was it…? Before Dublin Bay’s amateur sailors got it all organised in a manner that racing sailors today would recognise. Hal’s original comment at the end of W.M. Nixon’s fascinating piece can be read at the link above. We thought it would also make a great post here: the pre-history of organised yachting. And of course, we should say that the 2nd Edition of Hal’s popular book, DUBLIN BAY – THE CRADLE OF YACHT RACING, can be purchased online here. Well done William! A splendid account of early Irish yachts and yachting, before our amateur sport became established in the 1850s. 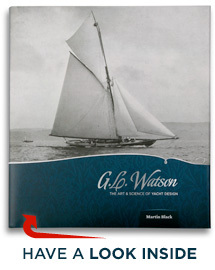 But how significant were the Clubs, and were the early yachts truly leisure craft? “a vessel of state, usually employed to convey princes, ambassadors, or other great personages from one kingdom to another”. Yes, the Dutch, and the Cork gentry, occasionally engaged in admiral sailing. But as with the early 19th century clubs in the English speaking world, were such clubs not primarily “monuments to social exclusivity”? Club rules were more about blackballing prospective new members, of course only yacht owners, and defining distinctive uniforms, and rituals for dining ashore. Gentlemen’s clubs, yes, but not true sailing or yacht clubs we might recognise. Contrary to the conventional foundation myth for yachting, the English did not introduce yacht racing in the 1660s. A once off race is recorded in 1661 between King Charles’ Catherine and the Duke of York’s Anne, but apart a few isolated examples in the 18th century, one cannot point to a continuous yachting tradition in England after the Stuart kings. If we may describe races as tests of speed, there were multiple races in the winter of 1662/3 in Dublin Bay where Sir William Petty wrote that he had successfully matched his experimental 30 ft catamaran on several occasions against the local-based “large black pleasure boat”. (The Dutch word “jacht” had not yet entered the English language.) Was this the World’s First Frostbite Series? The emergence of (Royal) Yacht Clubs in the 1820s and 1830s was a general social trend which we can see happening in every major port city all over the British Isles. Belfast, Cork and Dublin were part of this new trend, following the lead of the Royal Yacht Squadron in 1815. Such clubs all followed a similar pattern of development, and the fashion eventually took root on America and on the Continent in the 1840s. I recently confirmed with Elisabeth Spits at Het Scheepvaart Museum in Amsterdam that there are no records of any yacht races in Holland from the very first yachts of around 1600 right through to the late 1800s. This also confirms the Cork phenomenon as an outlier of this Dutch tradition. Although of a new departure, the Royal Yacht Squadron of 1815 was at first reluctant to get involved in racing, or anything more than occasional stately processions. 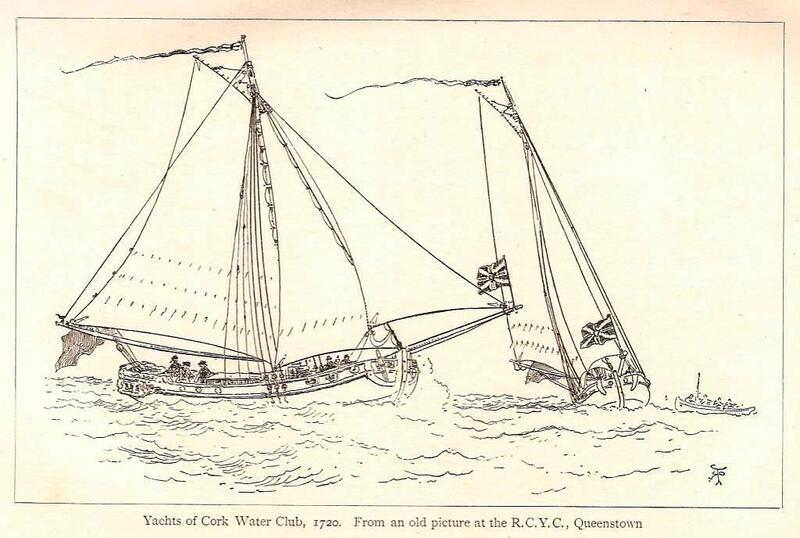 Yachts of the Water Club of Cork, 1720. Do we over emphasise racing? It’s the litmus test and the trigger for active participation by true amateurs, and for experiencing the challenge of sailing in conditions when casual day sailors will naturally avoid. On board non-racers we may not be truly involved as crew and we may be mere passengers, which many so-called early “yachtsmen” were on their professionally manned floating carriages. That passive on-leisure use was more necessary and evident in Ireland, not just in Cork, but also on Loughs Ree, Derg and Erne, unlike England which is less well endowed with lakes. So instead of identifying as our predecessors those self important clubbable gentlemen dining ashore, we may empathise more with those actively sailing small craft, with small yacht racing on the Thames in the late 18th century, and especially on our Irish lakes, and in Dublin and Cork in the 1820s. And especially with the Sligo “Ladies of the County” who in 1822 presented their splendid silver trophy for “fast sailing on Lough Gill”. They raced in cutters not longer than 26½ feet overall around an 18 mile course, sometimes completing it at an average of 8 knots. Add to that the Water Wags of Dublin giving the world the One Design concept in 1887, and we may well ask who made the greater contribution to our sport and who left the greater lasting influence? 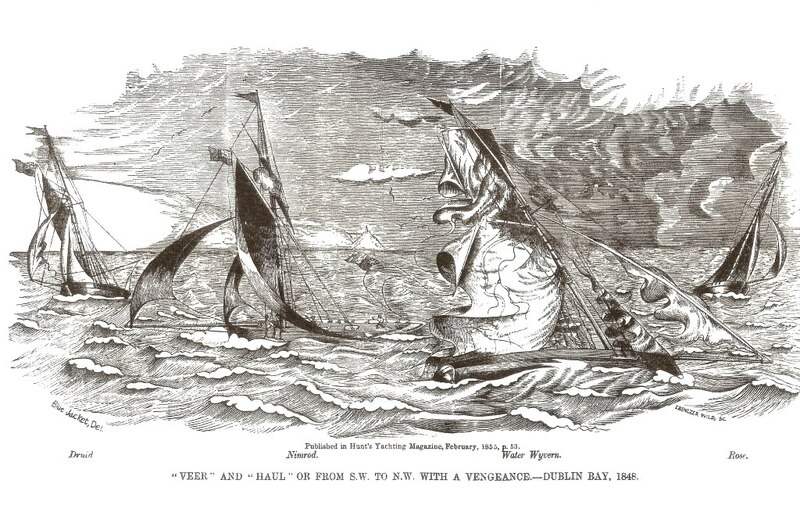 Yachting historian Hal Sisk describes how the worldwide sport of yacht and dinghy racing was popularised and formatted by the pioneering yachtsmen of Dublin Bay in the revised 2nd edition – with data added on how, when and where the sport spread – of his popular, DUBLIN BAY – THE CRADLE OF YACHT RACING. Read more and purchase online here. This entry was posted in book, Dublin Bay - The Cradle of Yacht Racing, gift, Hal Sisk, Irish yachting, journalists, object of desire, other yacht designers, yacht clubs, yacht racing, yachting history and tagged Dantzic, Hal Sisk, jacht, Ladies Cup, Royal Alfred Yacht Club, Royal Cork Yacht Club, Royal Thames Yacht Club, Royal Yacht Squadron, royal yachts, Sir William Petty, Sligo Yacht Club, Spiegeljachten, W.M. Nixon, Water Club of Cork, Water Wag, Wherry, Winkie Nixon. Bookmark the permalink. Do you have a record of ‘Corinthian Match’ at Royal Alfred Yacht Club on 16th June 1883 won by KATIE.? Yes. Will reply by email, Patricia. Could you also share with me this information via email. I happen to have a small trophy from the event.